Drainage Water Management (DWM), given sufficient rainfall, allows the user to manage their water by raising and lowering their outlet depth. Drainage Water Management (DWM) is a low cost, effective water conservation practice that controls soil water table elevations and the timing of water discharges from subsurface agricultural drainage systems. DWM simultaneously improves water quality and the soil environment for better crop yields. 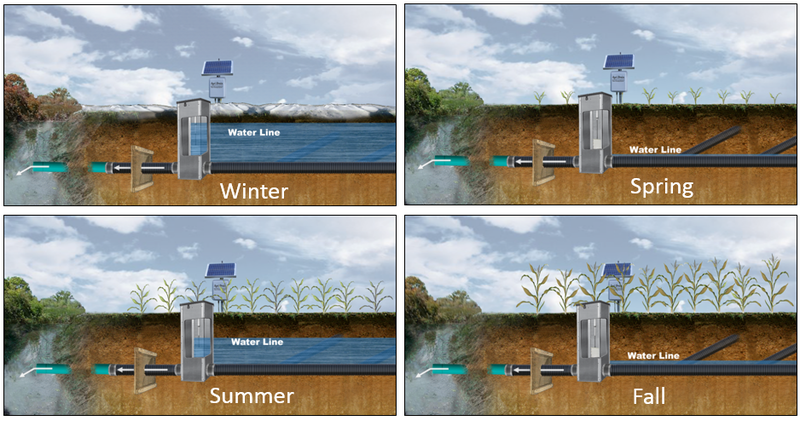 This conservation practice enables land with limited productivity due to wetness to become more productive and more profitable when implemented with existing or new tile drainage systems.Drainage water management allows users to manage their water table when structures for water control are installed in a main, sub-main, or lateral in the tile system. By using this drainage water management system in place of conventional drainage, producers conserve water, and can reduce nutrient losses to streams by 30-50%. With drainage water management, installed water control structures are adjusted based on the season and drainage needs throughout the year. The DWM system management includes raising the water level after harvest to hold as much water as possible in the soil profile. This facilitates as much denitrification as possible in the offseason to gain environmental benefits. In the spring, the water table is lowered to facilitate field work and planting. Once field work is completed, water levels are raised and then managed at the proper level to conserve as much water for crop use as possible while not damaging crop root development. Diagram showing the desirable management scenarios with DWM. This allows for better yields and trafficability in the field. The practice of drainage water management is most cost effective on flatter fields with a one percent or less slope. Designing a new tile drainage system that will allow the maximum number of acres to be managed is crucial. Retrofitting existing systems can be done, but the acres that may benefit are at times limited by the conventional design usually used in these systems. Installing laterals on the contour allows the practice to be used on somewhat greater slopes and allows each structure for water control to manage the maximum number of acres in the field. If there are proper soils and a water source, sub-irrigation may be easily implemented using the system designed for drainage water management with a few minor changes. This system uses all the benefits of good drainage, DWM and sub-irrigation to maximize yields.